Preface to the Special Issue: How Can Architecture Open Fukushima's Blockage? Nearly two years have passed since the Fukushima No.1 Nuclear Power Plant accident. In that period, really many issues have appeared, interlocked, piled up unsolved, and blocked steering. Meanwhile, regrettably, we can never say that architecture has provided much in terms of suggested issues, accurate examinations and studies, or concrete action. This is obvious in comparison with the many university studies and experts who have come and supported the tsunami-devastated areas in Iwate and Miyagi. Also books and magazine articles related to nuclear accidents have appeared in this world one after another, from journalists, thinkers, historians, and sociologists, urging a re-asking of how society, economics, politics, and science and technology should be; by comparison, the architectural field has not been able to draw a concrete image of how its specialty can be put forth for Fukushima's problems. Even in JABS, this issue is the first to pick up the nuclear-devastated area from the front, except for the serial report on temporary housing. In the background of the architectural field's few arguments, there are extremely particular circumstances in the nuclear accident. The nuclear power plant is still not stable, and there are not a few vacillations of governmental principles. In this case of radioactive contamination, even field investigation cannot be done easily. And although architecture happens only when there is land, architecture has become paralyzed before the situation of immense land long pending because of invisible contamination. Therefore, we titled this issue's feature Fukushima and Architecture. Again, it will soon be two years, and most of the problems that make recovery difficult have already occurred. That's where the wisdom of architecture is sought. A concrete view could and should be drawn. In planning this feature, we decided not to argue about some issues: electricity and energy, power plant location, power plant abolition, reactor buildings, theories of national land, and rumor damage. They are all important viewpoints, and although we thought it meaningful to approach Fukushima with such a "compound eye," limited space requires that this feature focus on themes with a view toward recovery of the devastated areas. There are two editorial policies: First, picture as correctly as possible the evacuation circumstances of more than 150,000 people after the power plant accident and try to grasp the exact points of contention. Second, avoid falling into abstract argument, but, for Fukushima's recovery, picture possibilities that are even a little more practical in relation to the wisdom and techniques of architecture. Part 1, "What Long-Term Evacuation Was - A Summary and Outlook of Architectural Subjects," presents articles about problems such as evacuation circumstances in nuclear plant disaster areas, first-aid temporary-housing measures, applications of architectural stock for long-term evacuation, and splits in families and communities. The content of each article could not have been written without time and effort spent in examination and practice. The round tables present comprehensive discussions about the conditions of planning theory supposing these long-term evacuations, and points of dispute are extracted. Inserted between part 1 and part 2 is a chronology that takes pollution diseases, industrial-waste issues, volcanic disasters, and Chernobyl as historical reference items. 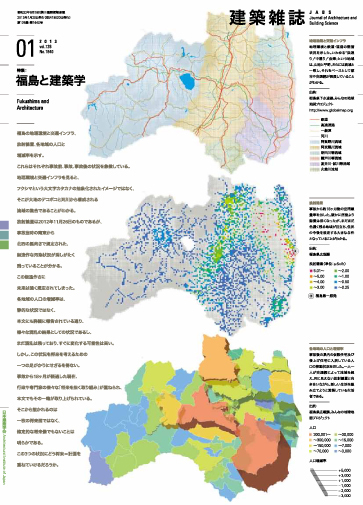 In part 2, titled "Architecture That Supports Recovery," Fukushima's recovery is discussed after grasping the outline and issues of recovery plans and town development, and the local characteristics of recovery issues. It is designed so that, in addition to experts who work for a prefecture's creation and adjustment or the recovery support of individual regions, young experts from various fields who are not directly involved in disaster areas are also members and make possible suggestions for the future. First, the round table based on field inspection was held in Koriyama, and then people who could not participate gathered in Tokyo for discussions based on reports from the Koriyama round table. Days later, we conflated suggestion memos from members and wrote the article. Next, as much as possible we covered architectural techniques that support Fukushima's recovery: decontamination of living environments, structures at nuclear power plants, mid- to long-term temporary living and bilocal living, risk communication, recovery-scenario studies and sharing techniques, and creating environments for kids' play. For this feature, Hiroshi Suzuki, Tomoyoshi Urabe, and Sei Haganuma have cooperated from the planning stages, and we thank them. This issue has been edited by Shin Aiba (Tokyo Metropolitan University) and Taku Kondo (Taku Kondo Design, Inc.). 008 [Preface to the Special Issue] How Can Architecture Open Fukushima's Blockage? Copyright© Architectural Institute of Japan. All Rights Reserved.